Congratulations to Dr. Vincent J. Iacono on receiving the American Academy of Periodontology’s Gold Medal, the highest honor of the Academy! The award was presented at a ceremony during the American Academy of Periodontology’s 2015 Annual Meeting in Orlando Florida. Dr. Iacono is the Distinguished Service Professor, Tarrson Family Professor of Periodontology, Director of Postdoctoral Education, and Chair of the Department of Periodontology at Stony Brook University’s School of Dental Medicine. 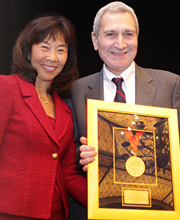 A Past President of the AAP, Dr. Iacono has also served as the Periodontics Commissioner for the Commission on Dental Accreditation; on the editorial board of the Journal of Periodontology; as vice president of the AAP Foundation; director of the American Board of Periodontology; and past president of the Northeastern Society of Periodontists, the Academy of Osseointegration, and the International Academy of Periodontology. He received the AAP’s presidential award in 2006 and has received many other citations and honors throughout his career. He is the author of more than 100 journal articles, 95 abstracts, and five book chapters, with research interests that include implants, biomimetics, tissue engineering, and periodontal medicine. Gold Medal Award: First conferred in 1967, the Gold Medal is the highest honor of the Academy. It is presented each year to a periodontist who has made outstanding contributions to the specialty through service and an understanding of the study, diagnosis, and treatment of periodontal diseases.